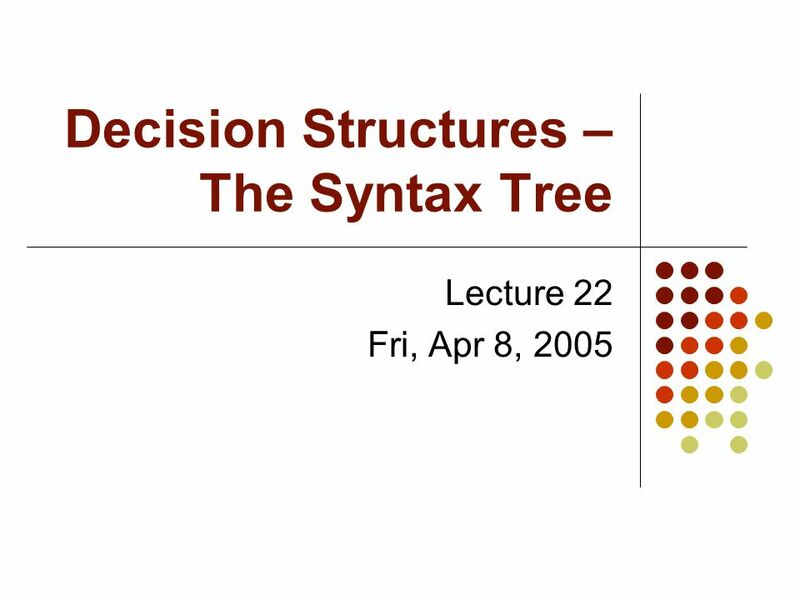 Decision Structures – The Syntax Tree Lecture 22 Fri, Apr 8, 2005. 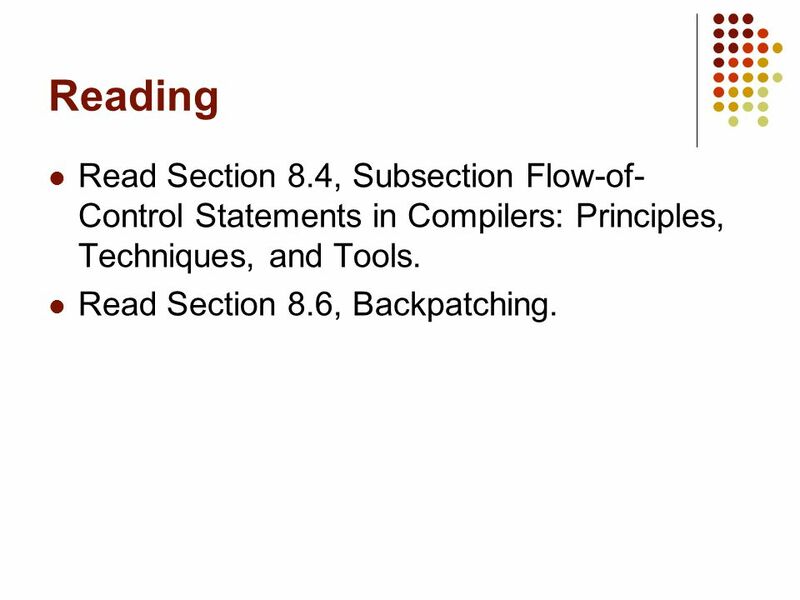 2 Reading Read Section 8.4, Subsection Flow-of- Control Statements in Compilers: Principles, Techniques, and Tools. Read Section 8.6, Backpatching. 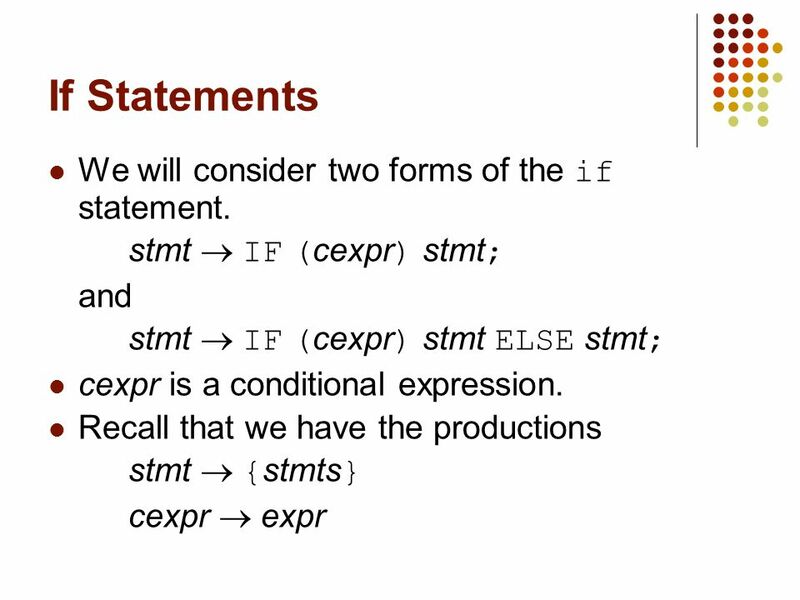 4 If Statements For the time being, we will assume that cexpr is a numerical expression. Zero is interpreted as false. 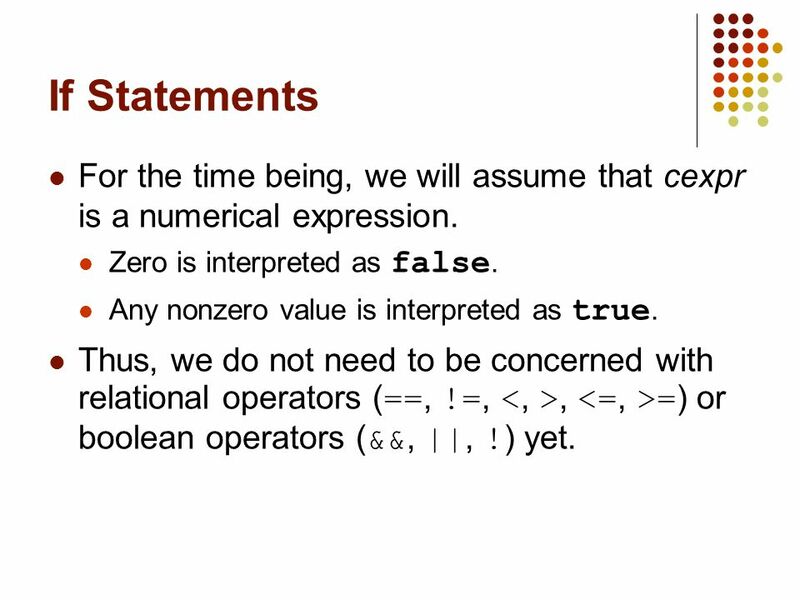 Any nonzero value is interpreted as true. Thus, we do not need to be concerned with relational operators ( ==, !=,, = ) or boolean operators ( &&, ||, ! ) yet. 5 Flow of Control Consider the flow of control for the production stmt  IF ( cexpr ) stmt 1 ; If cexpr is non-zero, then execution must jump to stmt 1. If cexpr is zero, then execution must jump to whatever follows stmt 1. Problem: We do not yet know where that it. 6 Flow of Control We need an object associated with cexpr that will contain two destinations. The “true” destination. The “false” destination. Such an object is called a backpatch node. 8 Backpatch Nodes Each backpatch node contains A “true” reference to a linked list of labels. A “false” reference to a linked list of labels. 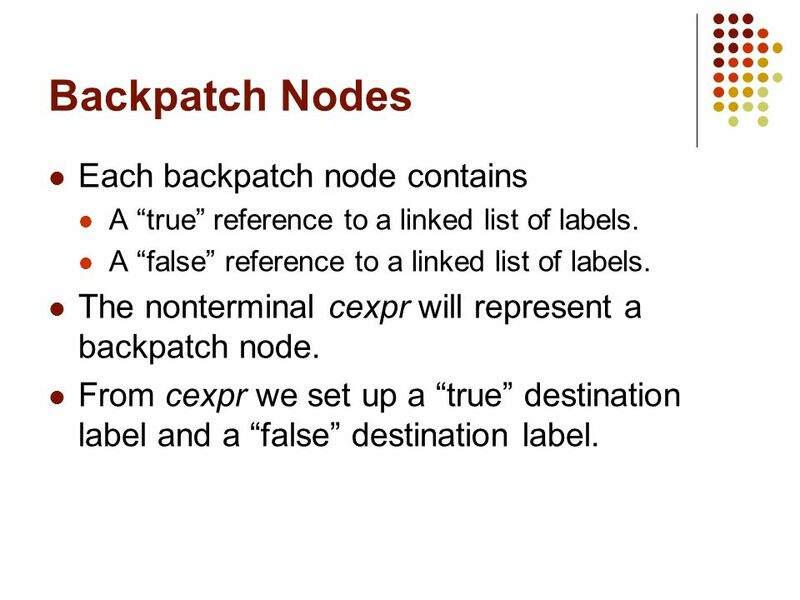 The nonterminal cexpr will represent a backpatch node. From cexpr we set up a “true” destination label and a “false” destination label. 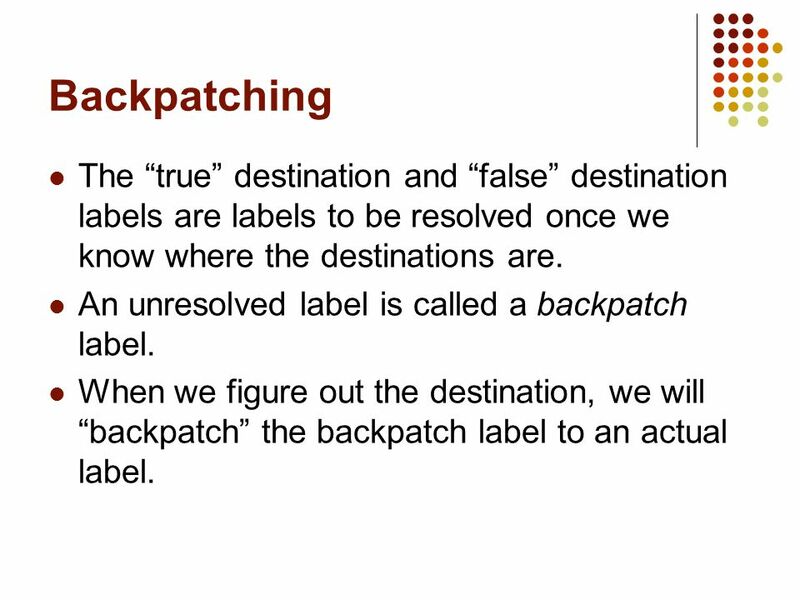 9 Backpatching The “true” destination and “false” destination labels are labels to be resolved once we know where the destinations are. 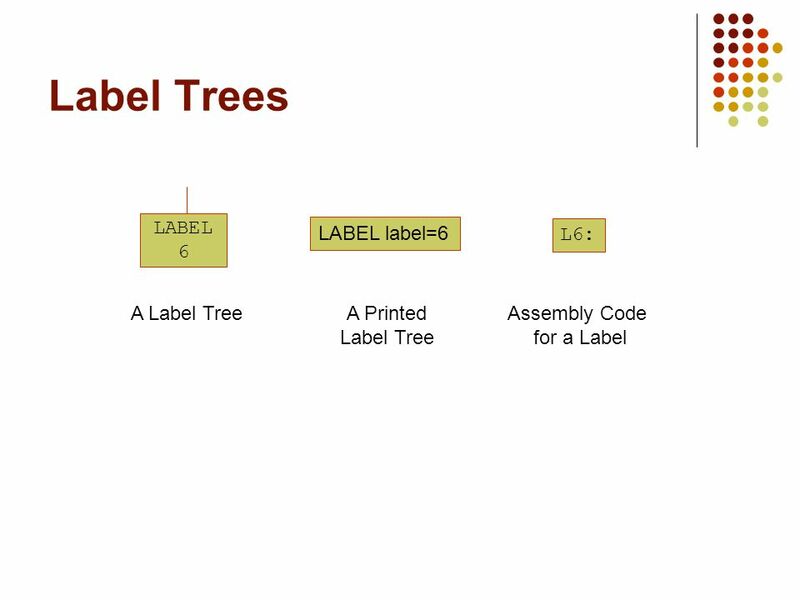 An unresolved label is called a backpatch label. When we figure out the destination, we will “backpatch” the backpatch label to an actual label. 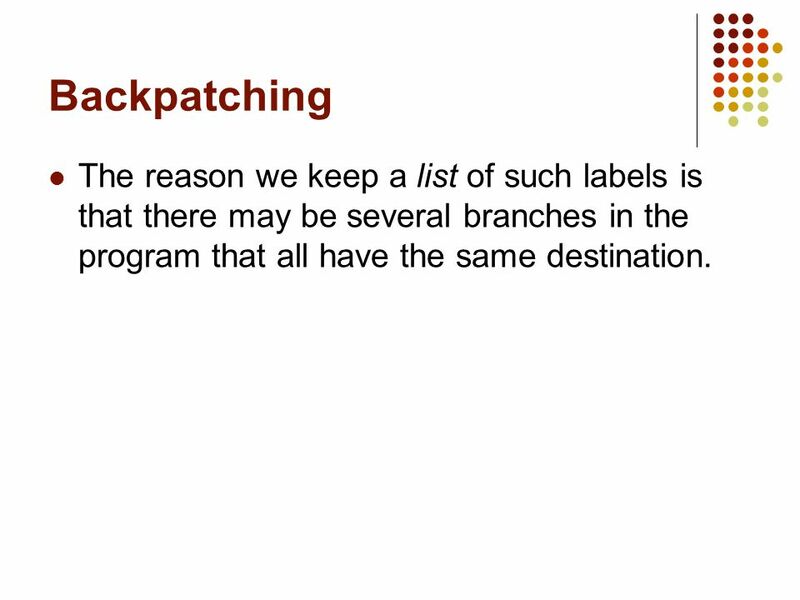 11 Backpatching The reason we keep a list of such labels is that there may be several branches in the program that all have the same destination. 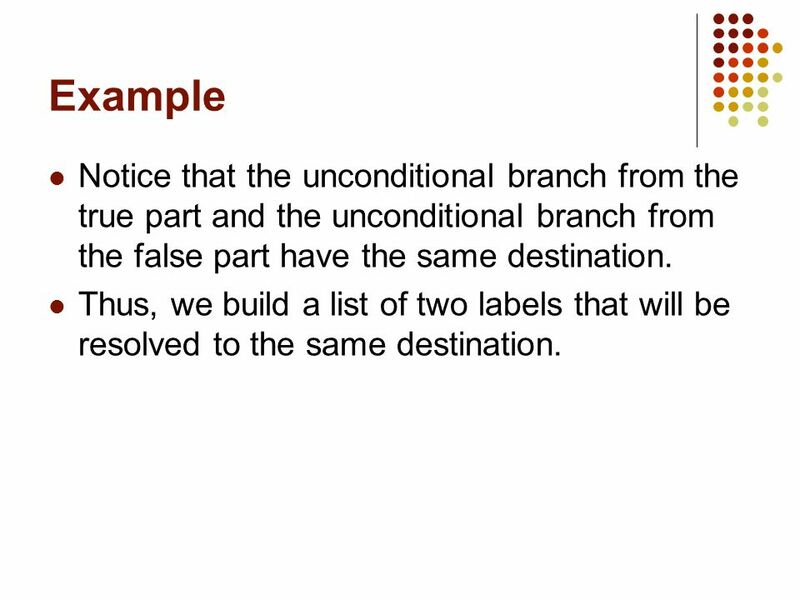 17 Example Notice that the unconditional branch from the true part and the unconditional branch from the false part have the same destination. Thus, we build a list of two labels that will be resolved to the same destination. 35 Example Within the if statement, there are two “known” destinations and one unknown destination. 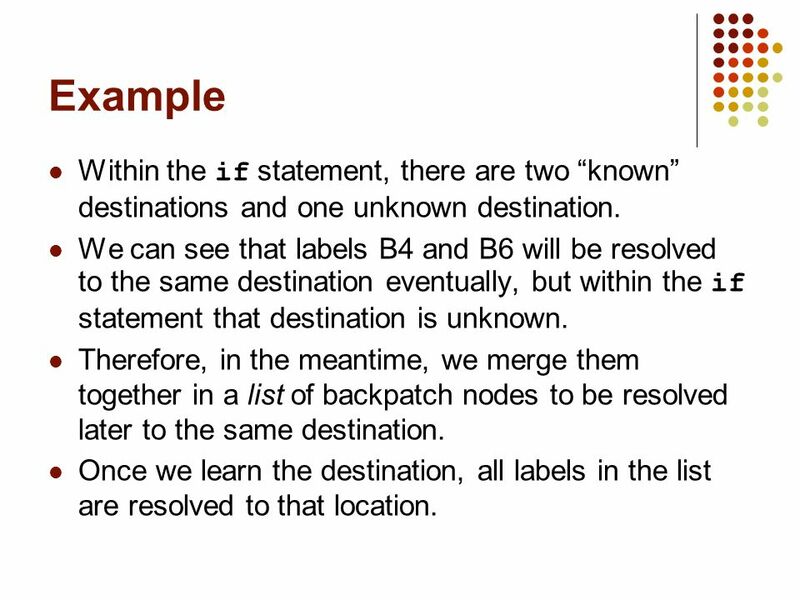 We can see that labels B4 and B6 will be resolved to the same destination eventually, but within the if statement that destination is unknown. Therefore, in the meantime, we merge them together in a list of backpatch nodes to be resolved later to the same destination. Once we learn the destination, all labels in the list are resolved to that location. 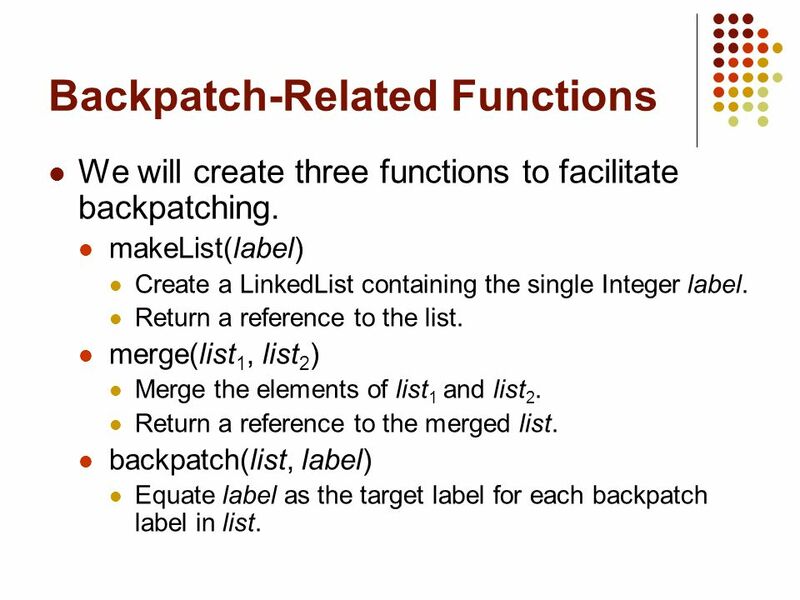 36 Backpatch-Related Functions We will create three functions to facilitate backpatching. makeList(label) Create a LinkedList containing the single Integer label. Return a reference to the list. merge(list 1, list 2 ) Merge the elements of list 1 and list 2. Return a reference to the merged list. 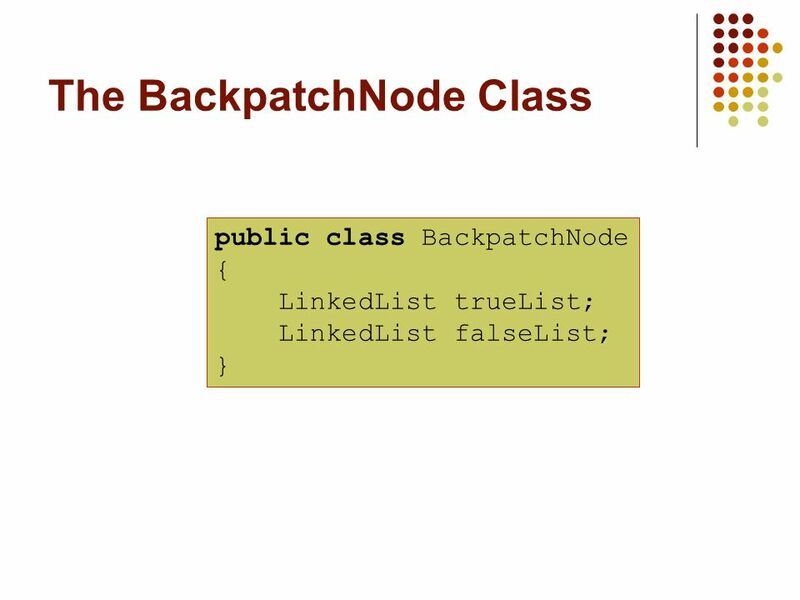 backpatch(list, label) Equate label as the target label for each backpatch label in list. 37 Labels and Jumps in the Grammar We saw in the example that actual labels are needed within the if statement to serve as destinations. We will incorporate the generation of these labels into the grammar. 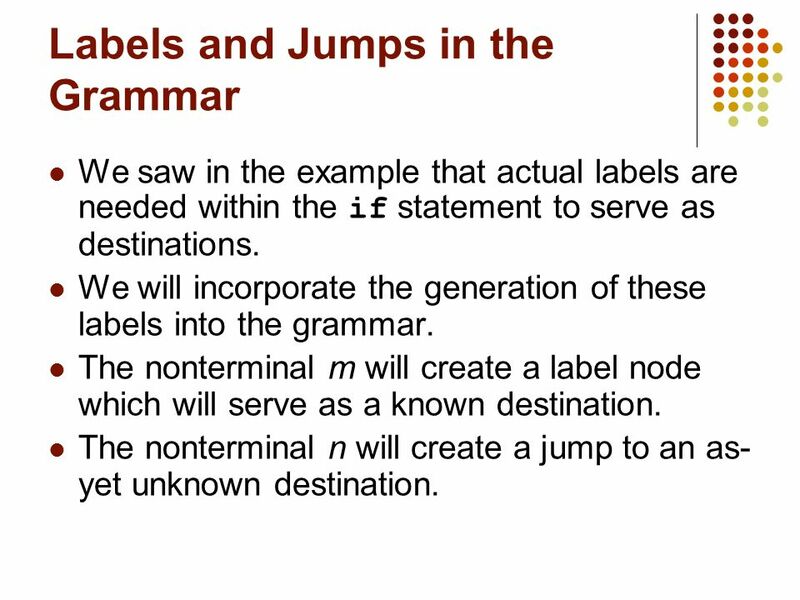 The nonterminal m will create a label node which will serve as a known destination. The nonterminal n will create a jump to an as- yet unknown destination. 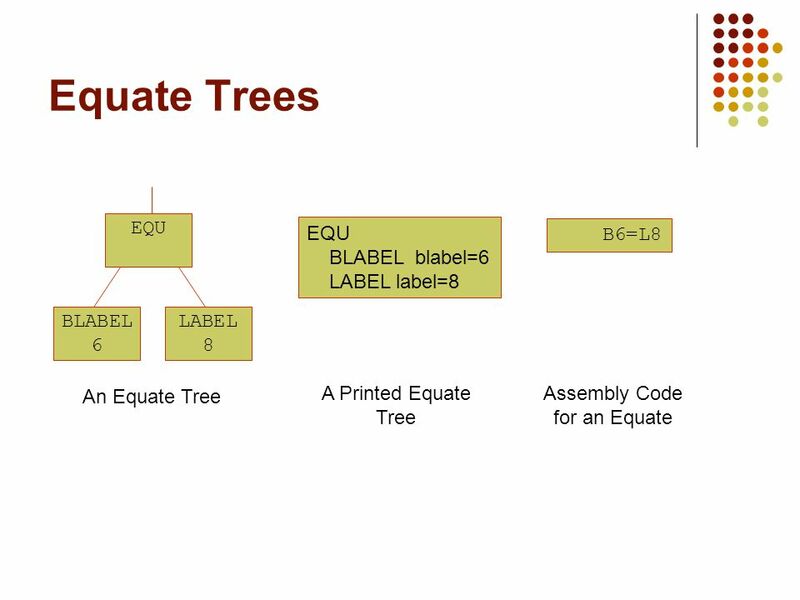 Download ppt "Decision Structures – The Syntax Tree Lecture 22 Fri, Apr 8, 2005." 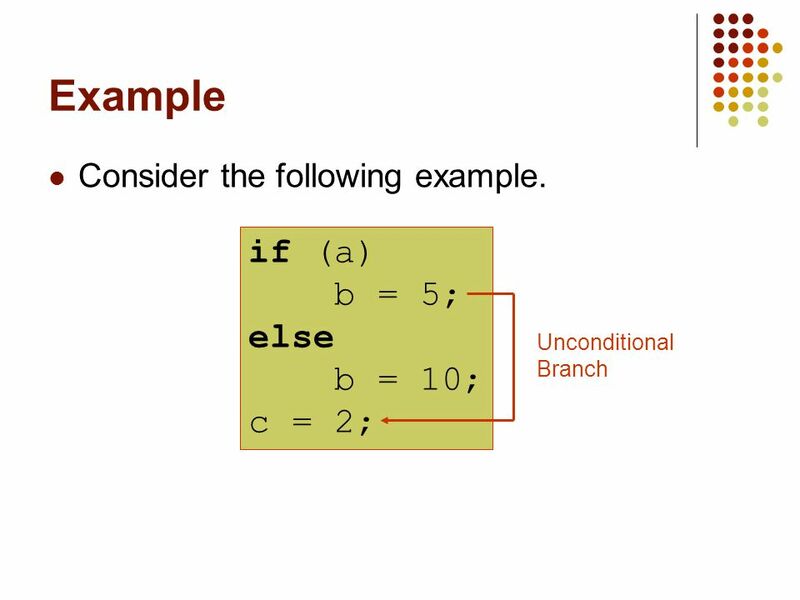 Decision Structures - If / Else If / Else. Decisions Often we need to make decisions based on information that we receive. Often we need to make decisions. Chapter 2 Flow of Control. Copyright © 2006 Pearson Addison-Wesley. All rights reserved. 2-2 Learning Objectives Boolean Expressions Building, Evaluating. ANALYSIS OF PROG. LANG. PROGRAM ANALYSIS Instructors: Crista Lopes Copyright © Instructors. 1. Programming Languages and Paradigms The C Programming Language. Chapter 8 ICS 412. 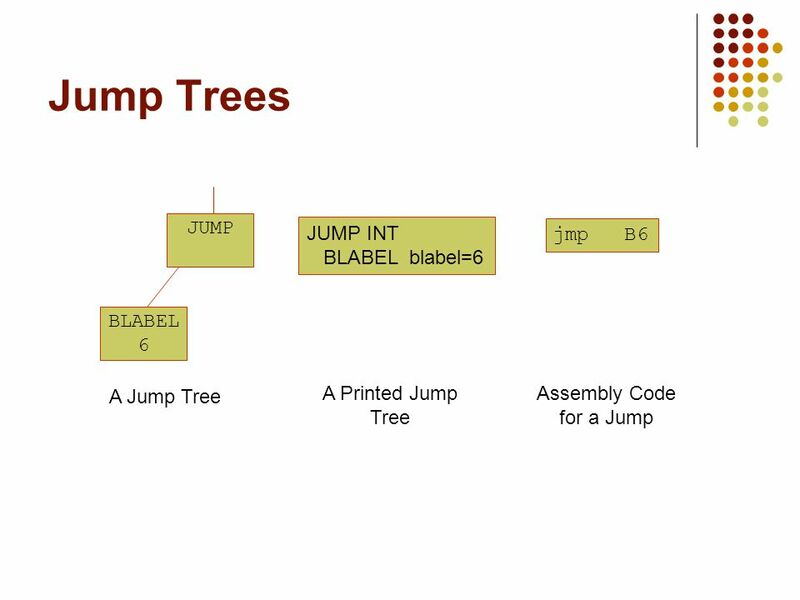 Code Generation Final phase of a compiler construction. It generates executable code for a target machine. 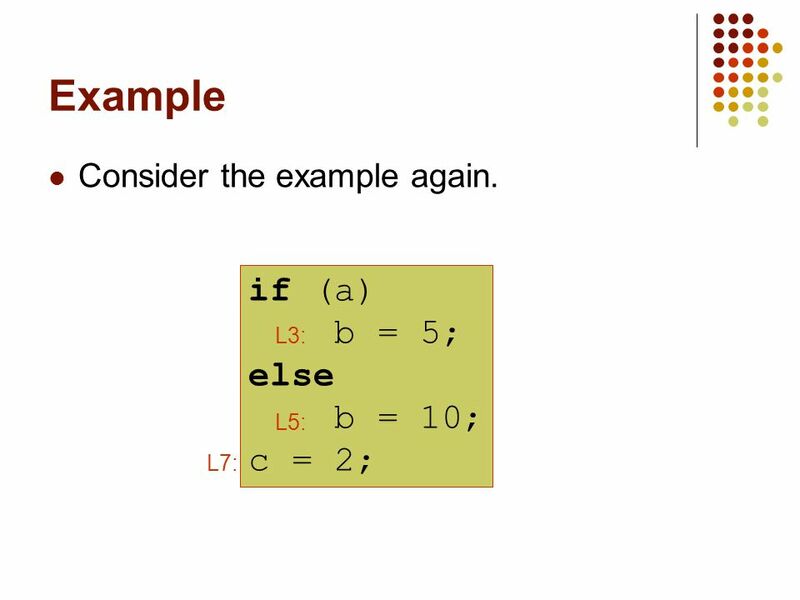 A compiler may instead generate. CPS3340 COMPUTER ARCHITECTURE Fall Semester, /15/2013 Lecture 11: MIPS-Conditional Instructions Instructor: Ashraf Yaseen DEPARTMENT OF MATH & COMPUTER. 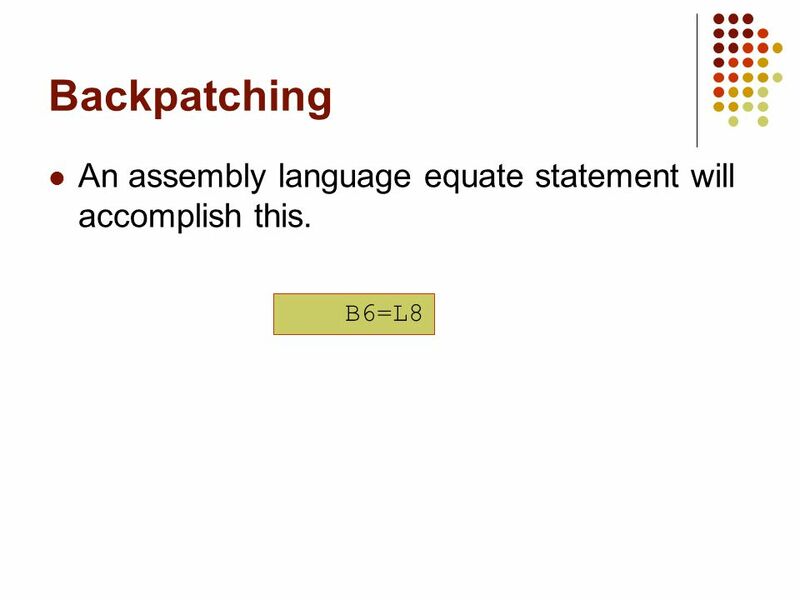 Backpatching: The syntax directed definition we discussed before can be implemented in two or more passes (we have both synthesized attributes and inheritent. Lecture 08a – Backpatching & Recap Eran Yahav 1 Reference: Dragon 6.2,6.3,6.4,6.6. 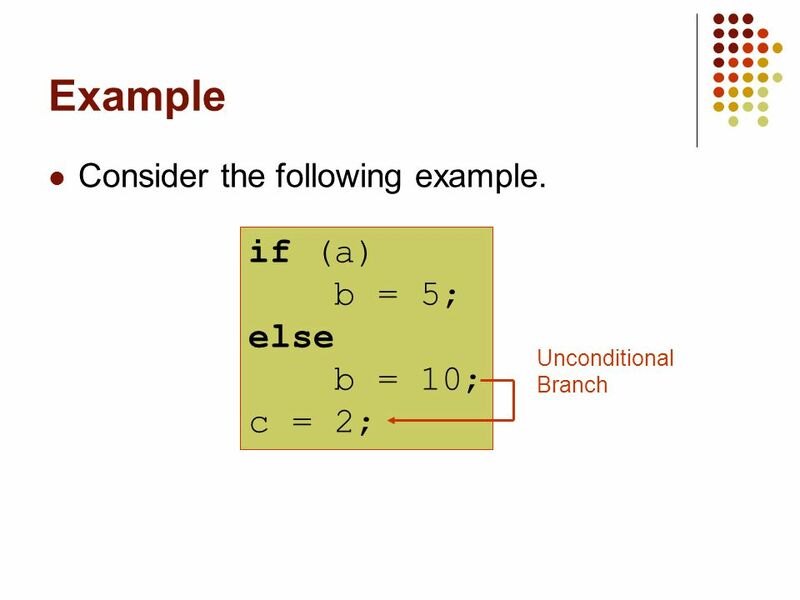 1 Compiler Construction Intermediate Code Generation. 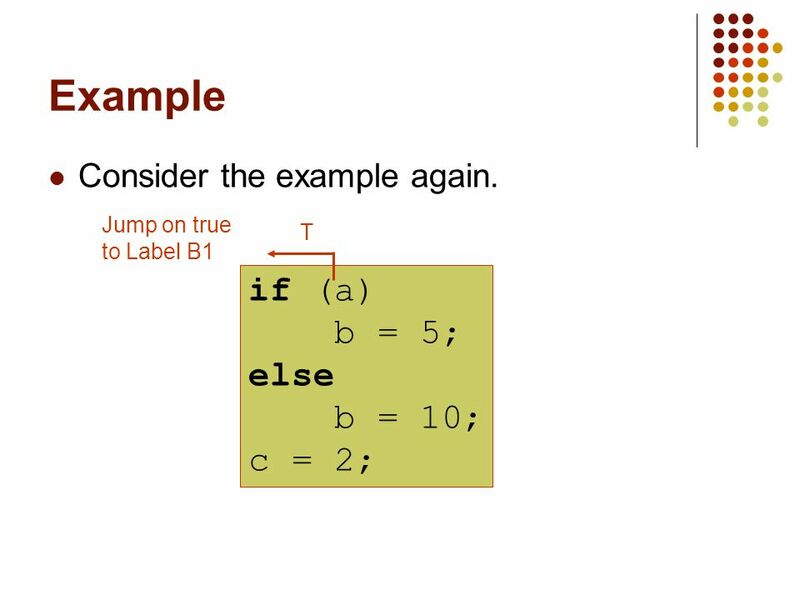 Generation of Intermediate Code Compiler Design Lecture (03/30//98) Computer Science Rensselaer Polytechnic. PSUCS322 HM 1 Languages and Compiler Design II IR Code Generation I Material provided by Prof. Jingke Li Stolen with pride and modified by Herb Mayer PSU. 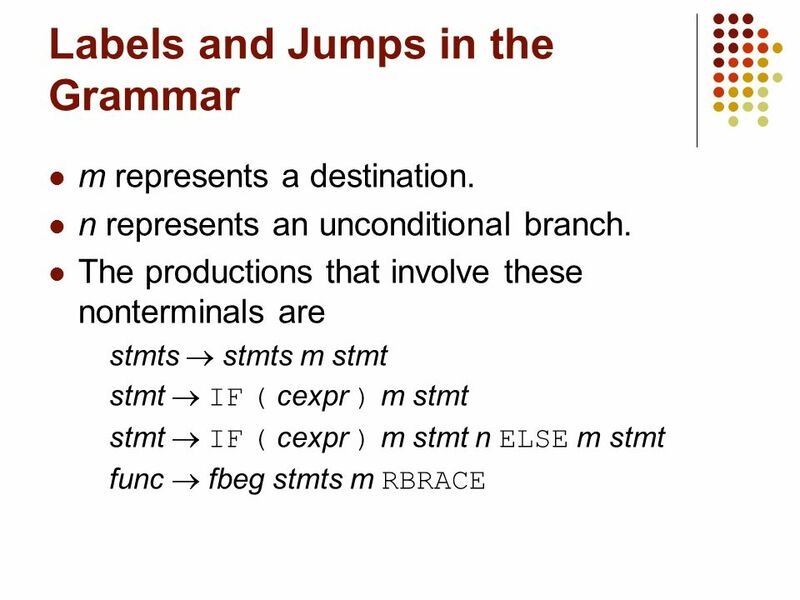 COP 4620 / 5625 Programming Language Translation / Compiler Writing Fall 2003 Lecture 10, 10/30/2003 Prof. Roy Levow.